The Delhi Sustainable Development Summit (DSDS), organized annually by The Energy and Resources Institute (TERI) since 2001, is an international undertaking that provides a platform for the exchange of knowledge on all aspects of sustainable development. Over the past ten years, DSDS has emerged as one of the most important forums on global sustainability issues, which brings together important heads of the State and Central Governments, academicians, and policy makers to deliberate over environmental issues. 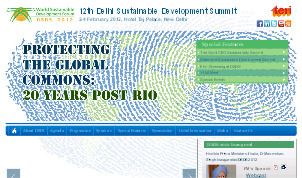 The theme of DSDS 2012 is Protecting the Global Commons: 20 years post Rio. The debates at this DSDS will revolve around the commons and take stock of the situation since the Rio summit of 1992.